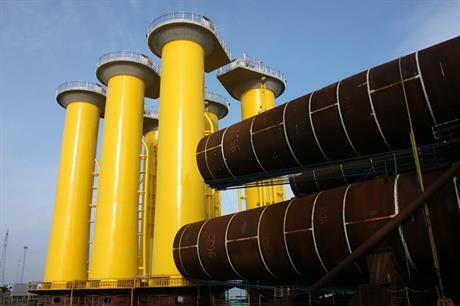 UK: Steel companies EEW special Pipe Constructions and Bladt Industries are to team up to set up facilities in the UK, manufacturing offshore turbine foundations. The firms have formed the Offshore Structures (Britain) joint venture to open a plant in Teesside in north east England. It will be based at the site of the TAG Energy Solutions foundations manufacturing facility, which closed in October. In a statement, the two companies said: "Bladt Industries and EEW will acquire the assets of Tees Alliance Group Corporate (TAG) which enables a rapid ramp up for the new company as a significant part of the facilities is already in place." The plant will manufacture monopile foundations and transition pieces, largely for the UK offshore wind market. Around 100 people are expected to be employed at the new UK facility initially, with a planned growth to approximately 350 workers. The speed of the growth will be dependent on the UK offshore wind market. Bladt and EEW plan to invest up to £30 million (EUR 38 million) for the acquisition, development and upgrade of the facilities. The news follows Bladt's suspension of operations at its jacket foundation facility in Odense, Denmark, where 160 jobs were cut. Speaking about the closure, the company said it was normal for work at the plant to be ramped up when orders were forthcoming and reduced when demand fell off.